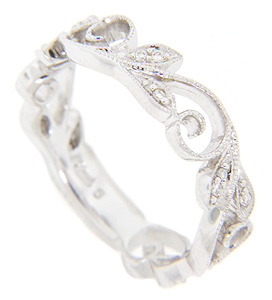 A flowing, vine-like design wraps around this 14K white gold antique style wedding band. The leaves are studded with diamonds. There are approximately .10 carats total weight of diamonds in the ring. 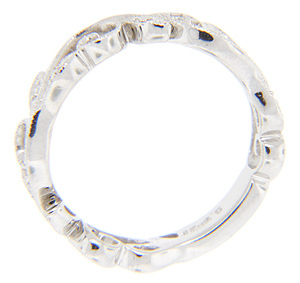 It is an elegant ring with a timeless appeal and can be worn with bracketing slim bands. The ring measures slightly over 5mm in width. Also in yellow gold (WB834) and red gold (WB1220). Size: 6 1/2. We can re-size.